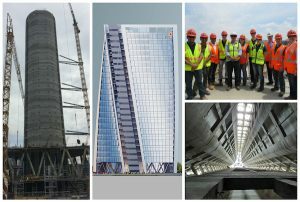 The team started their day off looking at two sites, the first of which being a twenty-six story PWC Tower that was being built by WBHO. Here we met a senior site agent by the name of Kobus Prinsloo who welcomed us into the camp’s office trailers just beside the massive concrete core. Here Kobus took us through the list of main players that were a part of the project and where they were at on the job. 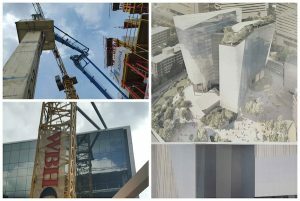 He informed us that the driving force behind the building of both PWC Tower and The Mall of Africa next door was that it was a part of a massive commercial development called Waterfall City. 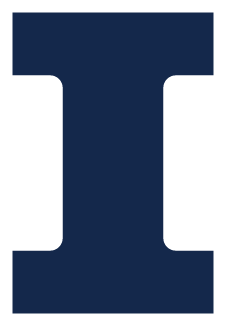 This endeavor was taken on by a company called Atterburry Property and their vision is to establish the next place for the ever-expanding urban populous to relocate. Atterburry is looking to attract both retirees and those looking for high end luxury housing. PWC tower is developed to be a work of art just as much as it is to be the perfect office space for one of the largest consulting firms on the planet. It is a reinforced concrete structure that that is designed to give the illusion that it is rotating as the building extends from the hill top. In order to achieve this effect, the floor slabs must be rotated about the center axis with each ascending floor and each column must be formed at an angle in the opposite direction of said rotation. For our site visit however, WBHO was just finishing up pouring the circular concrete core. They used a slip forming system and worked two twelve hour shifts seven days per week for thirty-three days to complete the core. They were able to average almost three meters per day in lift for the entire process! 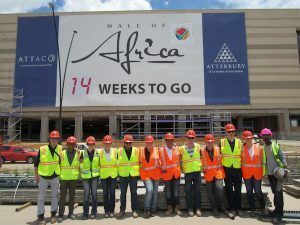 After concluding our tour at the PWC Tower, the team made the journey to the neighboring Mall of Africa project site. Here Quintin, the site’s WBHO project manager, took the team into his office to introduce us to the project, give us a quick safety brief, and allow us to ask him numerous questions. The project itself is a joint venture between WBHO and Group 5 that is being delivered in a modified core and shell and is set to open at the end of April 2016. The project is not the largest mall on the continent, but it is the largest mall built in one continuous construction phase; boasts a 280 store shopping center, four separate entrances, several levels of parking, and a wide variety of restaurants. Construction first began in October 2013 and the total project cost comes at almost 2.2 billion Rand. During our walk on the site we looked at the different elements for the job and discussed how they were able to manage such a large job with almost 4,000 construction personnel on site. One of the most interesting elements that we saw was the drywall work; being that masonry is so readily available here the interior partitions that we have seen have been mostly brick and mortar with a plaster surface. On this site however, the drywall did not stop and it was all beautifully done. The last site that we would visit on our Johannesburg excursion was another WBHO project called Alice Lane. Here our host Lance introduced us to the third phase of a building development that has been ongoing for years. Each phase is a separate building that was built on the same city block and upon completion of the Alice Lane project, each building will be tied together through what Lance called a “super basement.” Specifically, the Alice Lane project is an office building high rise that will sit 20 floors above grade upon completion. It features a panel system facade that is just starting to be placed onto the reinforced concrete structure that we got to examine on our site tour. 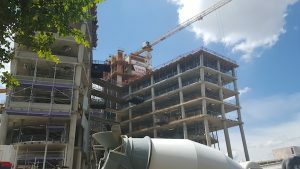 In addition to seeing the panel work, the team got the chance to climb to the top deck of the structure, which was the eighth floor, and got to observe a slab pour that was done with a modified boom pump. At the end of this visit we concluded the last of our professional events here in South Africa by saying goodbye and thank you to our friend Dr. Yomi of the University of Witwatersrand. He has been a huge help throughout this trip by acting as our South African liaison. If it had not been for all of his help the industry visits and educational opportunities that we had might not have been possible. So once again Dr. Yomi the GLCM program thanks you.